On April 2 Larry Kramer shared this photo saying he had broken his hip and was going to be having surgery. On April 4, Peter Staley wrote: "I heard from David Webster. Larry's surgery went well, and they'll be trying to get him on his feet today. He'll be sent to rehab pretty soon at Village Care." 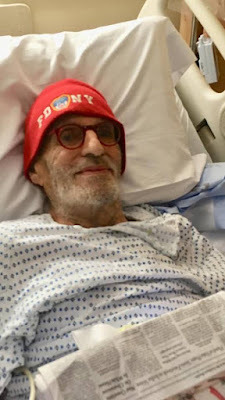 Here's wishing the legendary writer and AIDS activist and full and speedy recovery.